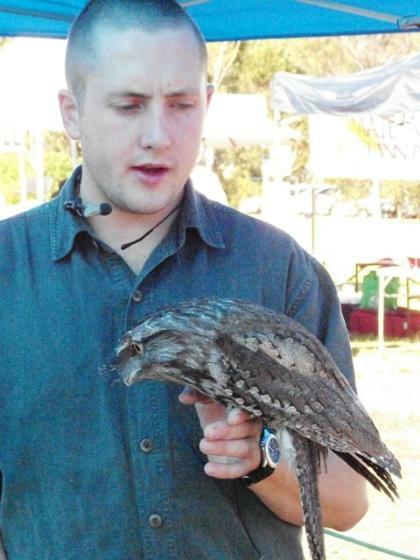 Above: Tom Covell and 'Frankie' the Tawny Frogmouth owl from Australian Wildlife Displays. A great interactive talk and presentation on local fauna all the children loved. The presentation focuses on how the animals in the environment are also Keepers of environment by eating or cleaning the refuse and featured a Diamond Python, Lace Monitor and Blue-tongued lizard. Below: rest stop to enjoy the day and view. Below: Cr. 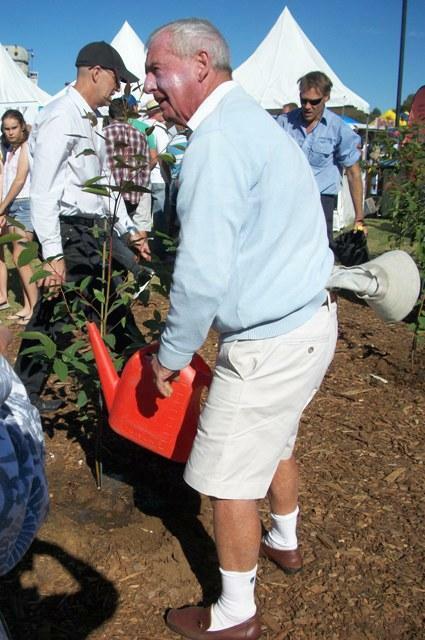 Bob Grace tree planting. Above: Cr.s Harvey Rose and Patricia Giles, Pittwater's current Mayor and Pittwater's first Mayor respectively. 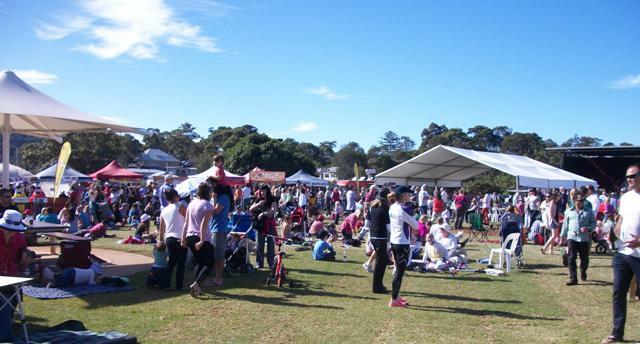 Pittwater has a number of great local markets that run each month. Fresh organic food can be purchased at Narrabeen (Rat Park) each Friday, the Artisan’s Market at Newport runs the third Saturday of each month (next 19th of May), Mona Vale’s Twilight and Palm Beach’s markets are crammed with stalls of great produce and products, arts and crafts, just about everything you could wish for. The annual Food and Wine Fair at Winnerreremy Bay has become one of the most popular and its focus is in being a family orientated day where you may enjoy a wide range of cultural delicacies, sip vintages all while enjoying the brilliant calm of this lovely park and its foreshores. Rides for children, animal talks on the importance of other local residents, a dearth of jams, macadamia nuts and breads were there for the tasting. A glorious day brought picnickers, music lovers and connoisseurs of fine foods and wines to this open green space. This year incorporating a number of sustainable living stalls, with a range of speakers addressing topics from how to cut your energy accounts to how to build a Green House, those represented covered the whole spectrum of all we may do to ensure the air gets cleaner, the water purer, the earth richer and the animals safer. One of the speakers we listened to was Graeme Jessup from Climate Action Pittwater whose own home was built to reduce energy costs. Pittwater Council has a ‘Pittwater Sustainability Principles and Checklist’ available to help those renovating or building in the area with guides on how you may, if you choose to, ensure your new rooms with views can continue to appreciate the beautiful vistas of Pittwater without impacting on said environment. Also part of this year’s Fair was Pittwater Council’s 20th Anniversary celebrations with a cake that looked like it’d definitely reduce your weight (?! 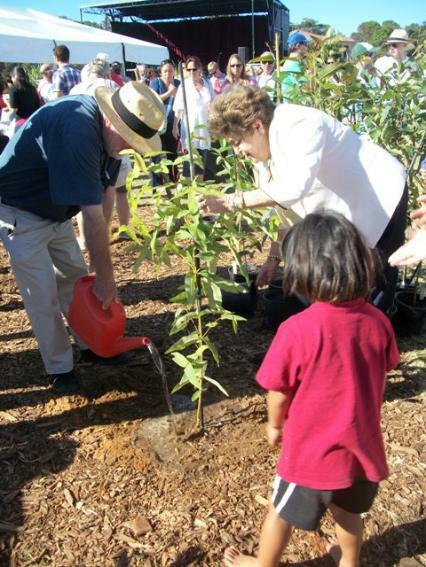 ), muffins being handed out to the crowd and a tree planting ceremony to mark the occasion. Cr. David James, when we asked “What tree is that?” replied that it is a Swamp Mahogany, Eucalyptus robusta, currently flowering in Warriewood and food for koalas and a range a birds like the Swift Parrot. Down along the foreshore family’s picnicked, little boys climbed available trees, little girls frolicked in fairy outfits, dogs ran in and out of the water, a unicyclist peddled while tossing skittles and seagulls dived on a pelican (some bird skirmish over who had water-fishing rights), which attended their squawkings only long enough to snap a beak back and point out a size difference before serenely sailing by. It was a wonderful day, brilliant Autumnal weather, yummy food and fine wines, great music provided by those who will be playing at Lizotte’s, thousands of attendees. We hope to bring you more regarding some of the local producers and the essence of those who spoke at the Sustainability Avenue during coming issues so we’ll save their diamonds and pearls for then. Images from the day on our Pictures page this week. See you next year! The “Pittwater Sustainability Principles & Checklist (Part A & B) – Single Dwellings, Alterations & Additions and New Homes” outlines sustainable options & principles for residential design and is intended to be a guide for home owners in regards to building and developing dwellings in a more sustainable manner.